When it comes to small cars, Australians have consistently shown their affinity for Japanese models – especially the Toyota Corolla and Mazda 3. And in the last decade or so, the love has spread to Korean cars – notably the Hyundai i30. That’s left European contenders such as the Ford Focus and Volkswagen Golf – models that perform so outstandingly in their own market (and the UK) – to conduct their own private, best-of-the-rest sales war. The Focus has generally had the upper hand since it replaced the Laser in 2002, yet the Ford has experienced an alarming slump in recent years. After posting peak sales of 19,180 in 2013, it has registered a total of only 19,848 between 2015 and 2017. Last year, just 3783 Focuses were sold. It’s difficult to disassociate the public relations disaster that was the Ford Powershift auto affair, which ended with the Australian Competition and Consumer Commission (ACCC) slapping Ford Australia with a $10 million fine. The company needs this new, fourth-generation Focus to hit the reset button. A great car would help, so let’s find out how good the Focus is by pitting it against its continental rival, and the model that has become the small-car benchmark. The Ford Focus Trend and Volkswagen Golf Trendline are the respective base models in their ranges. Ford and Volkswagen both forgo cheaper models to battle sub-$25,000 rivals, though a Focus Ambiente may well turn up in the near future. A Trendline manual is available for $24,990, though we have the $27,490 DSG auto version the majority of buyers will take. That’s an immediate $1500 advantage to the auto-only Focus. Both models share 16-inch alloy wheels, rain-sensing wipers, leather-wrapped steering wheel, Apple CarPlay and Android Auto, autonomous emergency braking, LED daytime running lights, and 8.0-inch infotainment touchscreens. The Golf Trendline has fatigue monitoring and parking sensors front and rear (whereas the Focus has audible guidance at the back only), but from there it’s pretty much all one-way equipment traffic for the Ford. The Focus is standard with navigation, voice commands, digital radio, Wi-Fi hotspot compatibility, lane-keep assist, lane-departure warning, forward-collision warning, technology that can automatically call emergency services in the event of a crash, and selectable drive modes. Rear-view cameras are standard on both cars, though the Ford’s split-view capability provides a wider, 180-degree angle. With no opportunity to upgrade the Trendline to VW’s higher-spec touchscreen systems, owners will have to use Google or Apple maps via smartphone integration (called App Connect). A $1500 Driver Assistance Package allows the Golf to catch up on drivetrain modes, lane-keep assist and emergency assist while adding adaptive cruise control, Traffic Jam Assist, blind-spot detection, rear cross-traffic alert, and semi-automatic parking (Park Assist). The Focus’s $1250 namesake package adds adaptive cruise, blind spot and rear cross-traffic monitoring, and Evasive Steering Assist that aims to help drivers in emergency swerve manoeuvres. Both models miss out on keyless start, while wireless charging is on the Focus ST-Line and Titanium models only. The Ford Focus has offered many stand-out qualities across its previous three generations, though cabin quality and presentation, while improved last time around, have never been among them. That makes for a pleasant surprise when stepping inside the new Focus, because Ford’s small car nails a lot of key areas. Ergonomics are excellent – from the invitingly natural driving position to the human diagram used for the heating-ventilation direction modes, and general placement of important switches that don’t require a stretch of the arm or a long search (the window switches are more easily accessible than the Golf’s, for example). Directly ahead of the driver is a wide, easy-to-view hexagonal instrument display that is mainly analogue, though with a top-centre graphic display that includes a digital speedo. The centre console presents a better execution of Ford’s rotary transmission dial compared with the company’s other latest model, the Endura – making room for other features where the SUV wastes space. Front-cabin storage is generous, and clever. There are two tray options for smartphones, (including one in the lower centre stack area also providing USB and 12-volt ports), cupholders that include a third ‘piccolo’ slot, the door bins take large drink bottles, and the console bin has a sliding armrest and, inside, a removable tray and another USB port. There’s also a pen clip inside the console bin, one of several nice details to be found in the Focus. Others include the credit card/ticket slot in the centre console, blue ambient lighting for the cupholder bases, and the attentively damped flip cover for the 12-volt port. If your rear passengers look a little green, it’s less likely to be motion sickness and more the envy of noticing all the practicality up front while they miss out on vents, USB ports and an armrest. At least there’s good space all round to accommodate people of varying sizes. So, all enough to displace the Golf for segment-benchmark interior? Not quite. Prod and poke parts of the Volkswagen’s cabin, especially the dash and centre console, and there’s a solidity to the Golf’s construction the Ford can’t match. The Golf’s array of buttons and switches generally looks the more expensive, and the way the German hatch mixes its harder plastics with matt plastics, soft materials and smart-looking silver trim elements gives it a more premium ambience. Its front seats look a bit posher, too, if not quite as fabulously comfy, and the 8.0-inch glass touchscreen is luxury-car grade. And although the Golf isn’t as practical up front, especially for smaller items, its rear seat provides vents and an armrest with cupholders (including cup-size adjuster). You also notice the rear upper door trim uses the same soft plastic as the front doors, whereas the Focus cuts costs with harder plastic for the rear doors. There’s decent legroom, if not as generous for knees as the Focus that’s longer in both vehicle length and wheelbase. Forget both hatches for carrying three adults in the rear, with the Golf’s middle seat the tightest for shoulder space and foot room. Ford quotes 341L for the Focus’s boot capacity, 39L shy of the Golf’s luggage compartment. It would be just a 5L difference, but Australian Focuses are fitted with a full-size spare wheel whereas Europe adopts a tyre repair kit. The Golf comes with a temporary space-saver. Away from capacity figures, the Focus’s boot offers a touch more width and the Golf provides a bit more depth. Split-fold seatbacks in 60-40 configuration are common, though the Golf’s set-up includes a ski port. The Golf 7.5 introduced in 2017 raised the bar for small-car infotainment with its 8.0-inch Discover Media and 9.2-inch Discover Media systems. Neither is available on the Golf Trendline, leaving owners with the company’s more basic Composition Media set-up that misses out on factory integrated navigation. Yet, the tinted glass touchscreen still looks classy and its operation and design are ultra-slick. Drivers will also appreciate the display being oriented towards them. There are just two physical dials, with short-cut touch-buttons either side of the screen (making it appear larger than it actually is). Nice bassy sound to the audio, too. If the Focus’s Sync 3 rival doesn’t quite have the same sheen of visual sophistication, it compensates with its features and multi-layered functionality. Graphics and fonts are sharp, and the screen’s response to finger presses is sufficiently speedy. And not only is navigation embedded as standard, but it’s a highly intuitive guidance system. You simply start to type an address into the nav’ page for relevant options to be displayed. There are Home and Work destination short-cuts, favourites, and quick selections to help owners find petrol stations, restaurants, chemists, cash dispensers, parking and cinemas. Digital radio, Wi-Fi hotspot compatibility and voice commands give Sync 3 further advantages over the Golf’s Composition Media system. For those who have followed the ongoing battle between Focus and Golf over the years, there’s unlikely to be a surprise when we say Ford yet again prevails with the small car that will most satisfy keener drivers. Whether it’s the best-handling Focus yet is a matter for debate, but the latest model offers highly accurate and likeable steering, and it feels lighter on its feet than its slightly overweight predecessor. And it dispels initial concerns about the Focus’s move away from the independent rear suspension it pioneered in the segment nearly two decades ago. The torsion-beam suspension, however, doesn’t provide as much positive news on the ride-quality aspect of the Focus’s dynamics. The Focus struggles to provide a consistently comfortable ride, becoming easily agitated over uneven roads. Our testing reflected the experience from the Focus launch last December – when we also discovered the only Focus variant to retain a multi-link suspension, the ST-Line wagon, provided more compliant progress. Volkswagen Australia has dabbled with both rear suspensions for its seventh-generation Golf, though all versions currently utilise the more sophisticated multi-link. And if the Golf doesn’t have the verve of the Focus, its supple, soothing ride will be appreciated on a more regular basis. It matches well with the VW’s steering that is slightly heavier than the Focus’s, but still well weighted and velvety. Smooth progress is further aided by the Golf’s 110kW 1.4-litre turbo petrol engine and DSG auto combination. While the seven-speed dual-clutch auto continues to create a touch of hesitation off the mark, its response to rolling off and back onto the accelerator pedal is much improved, and shifts on the go continue to be trademark quick. Acceleration is linear, and throttle response makes it easy to modulate precise speeds. The Focus’s engine is fractionally larger at 1.5 litres, though features just three cylinders. Nothing wrong with that, as even BMW has considered such an engine suitable enough for its signature 3 Series. Ford’s triple isn’t as beautifully balanced as the BMW’s, so you can feel both the engine – and pedals – vibrate slightly when stopped with the engine running. We could live with that quirk, especially as the 134kW three-cylinder provides spirited performance – especially in Sport mode – that bodes well for the Fiesta ST hot-hatch it will power later this year. Our testing, however, left question marks against the new eight-speed auto’s calibration. The new torque converter auto performs its shifting duties diligently on country roads, but in city driving it makes the Focus tricky to drive smoothly. A common issue for our testers was that if you asked for an incremental increase in momentum with a relatively subtle push of the throttle pedal, the Focus could instead respond with an undesirable burst of acceleration. A preference for high gears early for fuel economy’s sake can also leave the engine sounding laboured at times. Try to perform a three-point turn on a hill, and it takes the auto so long to grab reverse from the time you’ve turned the Focus’s transmission dial from D to R that the car can start rolling, forcing a switch back from the accelerator to the brake pedal. In another scenario, the auto stumbled when quick acceleration from standstill was requested to get the Focus across a busy road. While the Focus responded well initially, the transmission’s stutter left us temporarily exposed in the middle of the road. Ironically, it all left the Focus auto feeling more like a dual-clutch than the Golf’s DSG. With a firm, overly sharp brake pedal response, the Focus’s braking is also harder to modulate than the Golf’s. Fuel efficiency also falls in the Volkswagen’s favour. 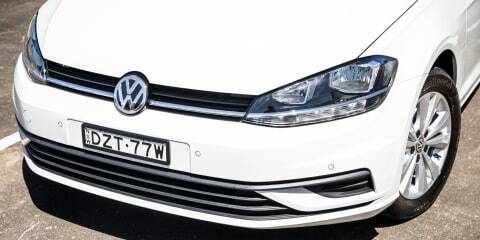 After an extensive urban/suburban loop, the Golf’s trip computer registered average fuel use of 5.6 litres per 100km compared with 7.2L/100km for the Focus. Official figures are 5.4L/100km (Golf) and 6.4L/100km (Focus). Both manufacturers attach five-year warranties to their new cars, with no limit on kilometres. The Focus’s servicing costs, though, will save you nearly $1000 over five years. Ford sets a consistent $299 price per annual service (or every 15,000km), whereas the Golf’s capped-price servicing varies from as low as $334 to as high as $756 for a five-year total of $2446. If you’re prepared to pay servicing costs in advance, the Golf is available with a five-year Service Plan that costs from $2012. However, with both vehicles requiring premium unleaded, the Golf’s official and tested (trip computer) figures say it will balance things out a bit with fuel savings. With an all-new, eighth-generation Golf set to be unveiled towards the end of 2019 (and due here in 2020), this would seem like the perfect opportunity to take on the outgoing version. And the Ford Focus at the very beginning of its life cycle serves up so much to like. There’s relatively sharp pricing to kick things off, followed up with a decent standard equipment list strong on technology, plus competitive service costs. The Focus has also raised its game in relation to cabin design while retaining the enjoyable-to-steer trademark of generations past. Yet, this twin test doesn’t end up being as close as we had imagined. Fairly pivotal to the result is the Focus’s disappointing low-speed drivability. Even putting that aside, though, there’s simply an unrivalled classiness to the way the Golf goes about its business of carrying occupants. While the compact Volkswagen can’t be praised for its pricing and equipment, there’s value to be found elsewhere. It feels that little bit more expensive than the Focus in the way it has been screwed together, and it feels a lot more civilised in the way it rides and performs. Even the DSG gearbox has never felt so good to use. The Golf, in fact, makes for a more convincing luxury hatchback than most vehicles marketed as such. 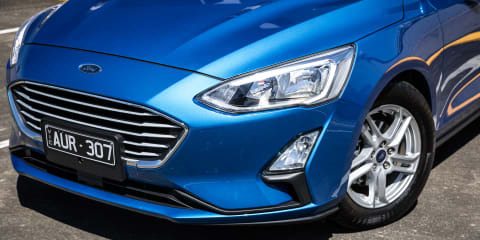 Editor’s Note: CarAdvice has mentioned the transmission experience to Ford Australia and asked the company to double-check whether our Trend test car had a calibration issue or not, adding that we would be happy to test another Focus (all models use the same drivetrain). A vehicle could not be provided in time for publishing.